Could you lose weight if you put $20,000 at risk? Would you finally set up your billing software if it meant that your favorite charity would earn a new contribution? If you ve ever tried to meet a goal and came up short, the problem may not have been that the goal was too difficult or that you lacked the discipline to succeed. From giving up cigarettes to increasing your productivity at work, you may simply have neglected to give yourself the proper incentives. 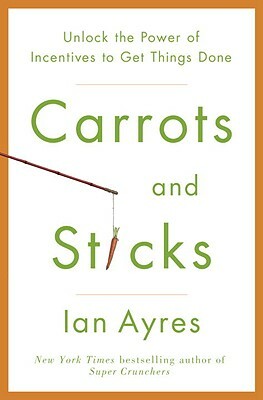 Ayres shares engaging, often astounding, real-life stories that show the carrot-and-stick principle in action, from the compulsive sneezer who needed a stick (the potential loss of $50 per week to a charity he didn t like) to those who need a carrot with their stick (the New York Times columnist who quit smoking by pledging a friend $5,000 per smoke . . . if she would do the same for him). You ll learn why you might want to hire a professional nagger whom you ll do anything to avoid no, your spouse won t do and how you can hand-tie your future self to accomplish what you want done now. You ll find out how a New Zealand ad exec successfully sold his smoking addiction, and why Zappos offered new employees $2,000 to quit cigarettes. As fascinating as it is practical, as much about human behavior as about how to change it," "Carrots and Sticks is sure to be one of the most talked-about books of the year. Ian Ayres is an economist and lawyer who is the William K. Townsend Professor at Yale Law School and a professor at Yale s School of Management. He is a columnist for Forbes magazine and a regular contributor to the "New York Times" Freakanomics blog. He served for seven years as the editor of the "Journal of Law, Economics, " and "Organization," and in 2006 was elected to the American Academy of Arts and Sciences. He has previously written ten books, including Super Crunchers, which was a "New York Times "business bestseller and named one the Best Economics and Business Books of the Year by "The Economist." He lives in New Haven, Connecticut. "